The Clare native will move into a new role in the Limerick college. 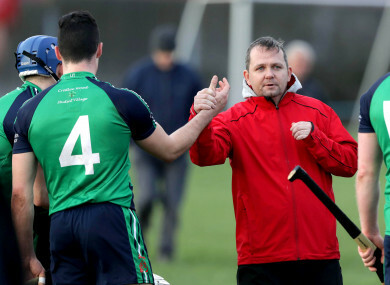 DAVY FITZGERALD HAS stepped down as manager of LIT’s Fitzgibbon Cup side after 16 years in charge. Fitzgerald led the Limerick college to Fitzgibbon glory in 2005 and 2007, while a host of talented players came through the college during his tenure. Instead, the Clare native will move into a new role in LIT. He will also act as an ambassador for the college. “I have very much enjoyed my time managing the LIT Fitzgibbon team over the last 16 years, and made a lot of friends both in LIT and outside it,” Fitzgerald said. President of LIT, Professor Vincent Cunnane paid tribute to Fitzgerald’s reign. “Davy is synonymous with LIT and with achievement,” he said. “As manager of LIT’s hurling team, he brought tremendous success to the college, bringing the us to a position of consistent competitiveness. To record a success rate of over 70% across a 16 year period is a remarkable feat unequaled by any manager in colleges hurling. In fact, during Davy’s tenure, LIT competed in the final weekend of every Fitzgibbon competition except four. Email “Davy Fitzgerald steps down as LIT manager after 16 years”. Feedback on “Davy Fitzgerald steps down as LIT manager after 16 years”.